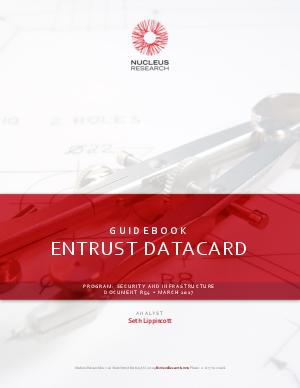 Entrust Datacard provides customers with a commercial security public key infrastructure (PKI) solution that addresses authentication and data protection needs for enterprise and government customers. Nucleus analyzed the experiences of Entrust Datacard customers in these sectors and found that customers were able to reduce risk, improve security information auditing, increase end user productivity, and reduce IT staff costs. Download this Guidebook now to find out more.